Now that Winter is basically gone, and we are well into Spring with Summer peaking it's head right around the corner.. it's time to start changing up our meals to healthier, lighter, but still delicious bowls of goodness that cool us down and freshen us up! 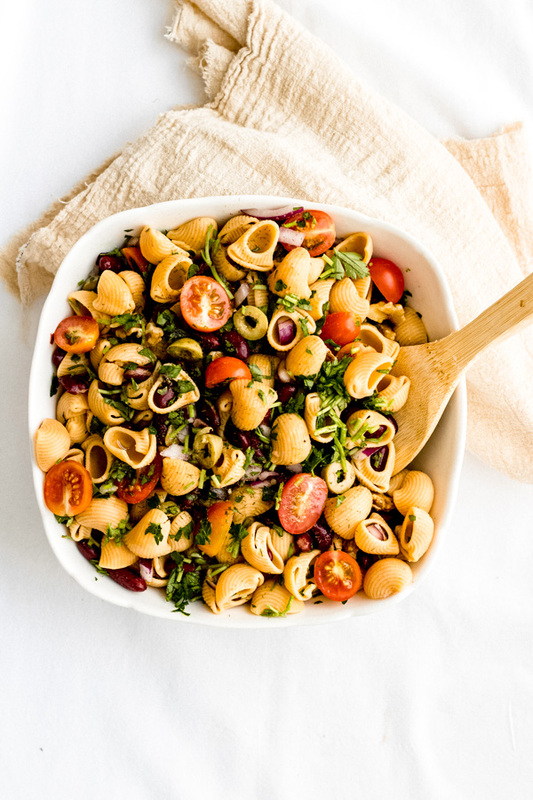 Enter hearty kidney bean chickpea pasta salad. 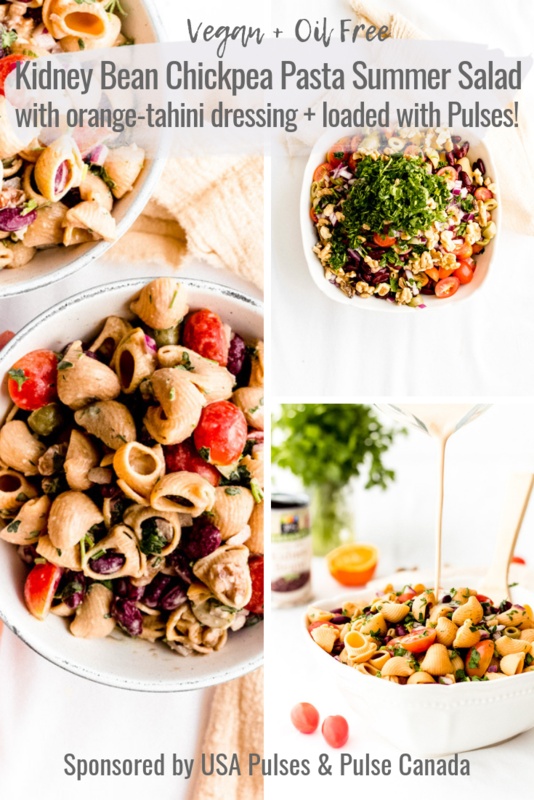 Served cold to beat the heat and loaded with good-for-you ingredients such as tomatoes, onions, parsley, olives, walnuts, and PULSES! Perhaps you're a little perplexed by the terminology, but don't be.. I am almost certain that you *have* had pulses before..
Pulses is the term given to the 'dry, edible seeds of plants in the legume family, which includes chickpeas, lentils, dry peas, and beans'. See? You've been eating pulses all along without even knowing it! Not only are pulses delicious but they also have a ton of benefits. For one, pulses are protein-packed which makes it a great choice for vegans or those on a plant-based diet.. They are also a great source of fiber, which every person can benefit from, especially in America where it is believed that as much as 90% of the people don't get enough fiber! Adding pulses to your diet can definitely help this statistic - and your health! As far as affordability comes in hand, pulses again, are one of the most affordable proteins out there. No need to waste money on expensive protein powders and shakes when you can get the nutrition from beans, lentils, chickpeas, or dry peas! You can eat pulses every day and not get tired of them for weeks.. that's because pulses have SO much variety! There are 14 different types of beans, 5 different types of lentils, and 4 different varieties of peas that you can get creative with in the kitchen! And now you can even find pasta and flours made out of pulses! For example - the pasta we are using in today's recipe is made with chickpea flour! These flours can also be used for baking and making things like cookies, pancakes, and breads. For more recipes with pulses check out the pulse.org website and click on the recipe tab. If you want more information about the different varieties of pulses you can check out this page that USA Pulses & Pulse Canada have set up on their website. The movement towards more sustainable food practices is growing. As a vegan myself I am mindful of the food choices I make and how they impact the environment and the planet. Another great benefit of pulses is their sustainability. They have a low carbon foot print, are water efficient, drought tolerant and also have the ability to convert nitrogen in the air into a plant-nutrient! Now that you know the tremendous benefits of pulses I bet you're excited to start adding all sorts of chickpeas, beans, lentils, and dry peas into your diet. And the best part is - it's super easy to do. The USDA recommends a weekly serving of 1 1/2 cups of pulses a week as part of a healthy eating pattern..
All you need is 1/2 cup of pulses, three times a week, to enjoy the many benefits of this superfood! 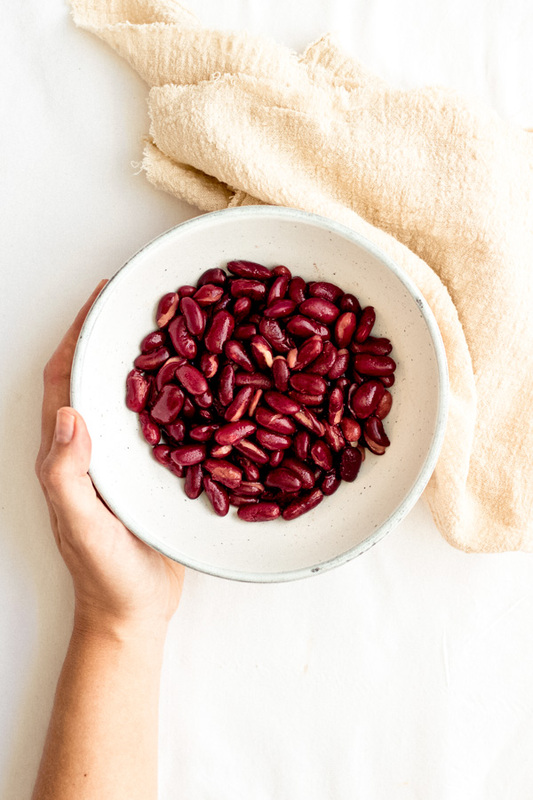 As a matter of fact, a Canadian study found that consuming just 1/2 cup of cooked pulses per day was associated with higher nutrient intakes of fiber, protein, folate, magnesium, iron, potassium, and zinc!!! All of this from only 1/2 cup! quick and healthy seasonal recipes delivered right to your inbox - recipes filled with PULSES! and you'll be entered for a chance to win weekly random prizes throughout this campaign. So what do you say? Are you ready to make a commitment to better health and consume at least 1/2 cup of pulses, three times a week? Because that's all it takes! So now that you know about pulses, let's get back to the salad for a second. 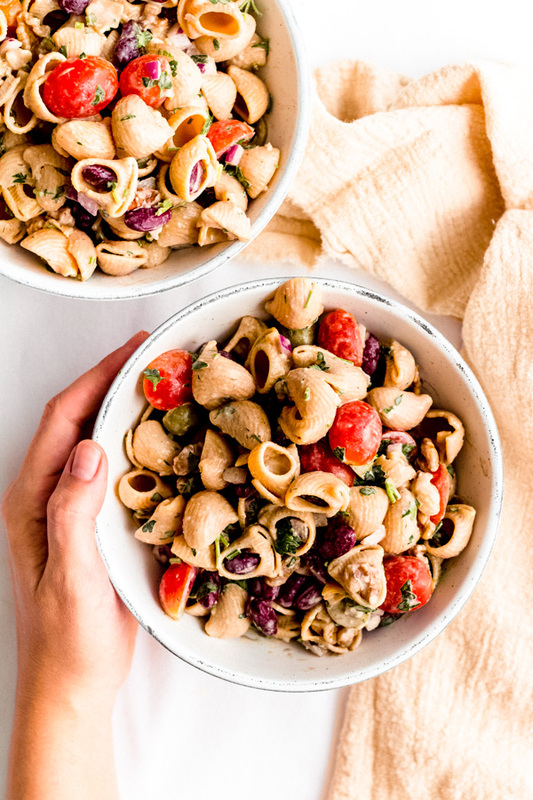 This pasta salad is the perfect way to get started in the half-cup habit because each serving has over 1/2 cup of pulses! Plus, there's tomatoes, red onions, parsley, and a few other delicious ingredients thrown into the mix. Since the theme is 'pulses' I didn't use regular pasta, instead I used pasta shells that are made out of chickpea flour. You can find this at your local Whole Foods, natural food store, or online on Amazon.com. 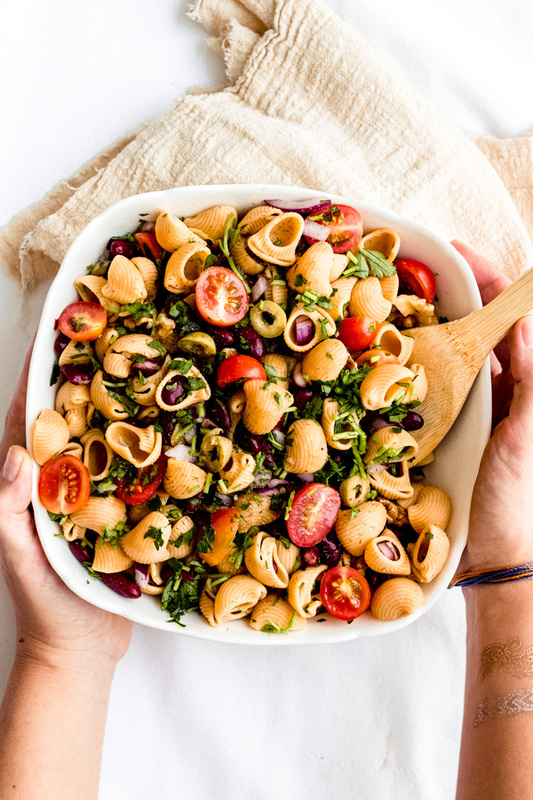 This Kidney bean chickpea pasta salad is perfect for any of the above. 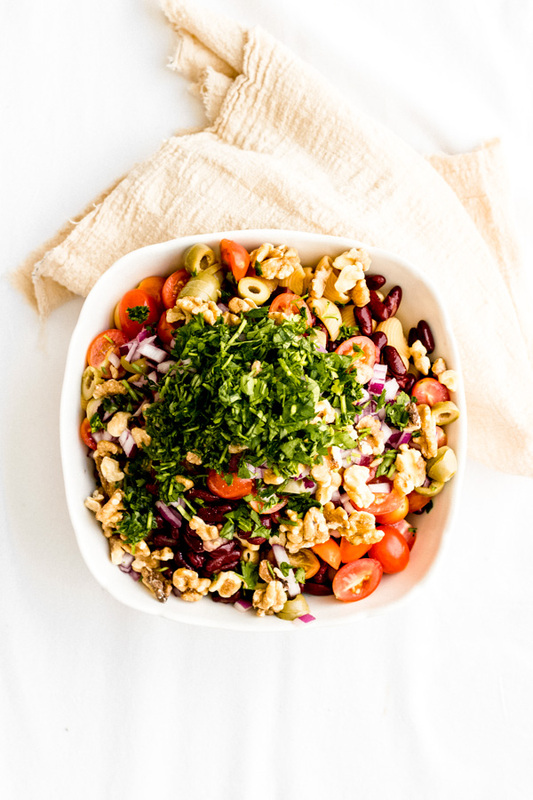 Share with friends and family and let them know that not only are they enjoying a delicious tasty salad, but also, the many benefits of pulses! 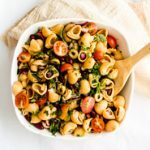 A tasty kidney bean chickpea pasta salad loaded with good-for-you ingredients like onions, parsley, tomatoes, and pulses! Prepare the pasta as per packaging instructions. You can do this step the night before to make things go even quicker. 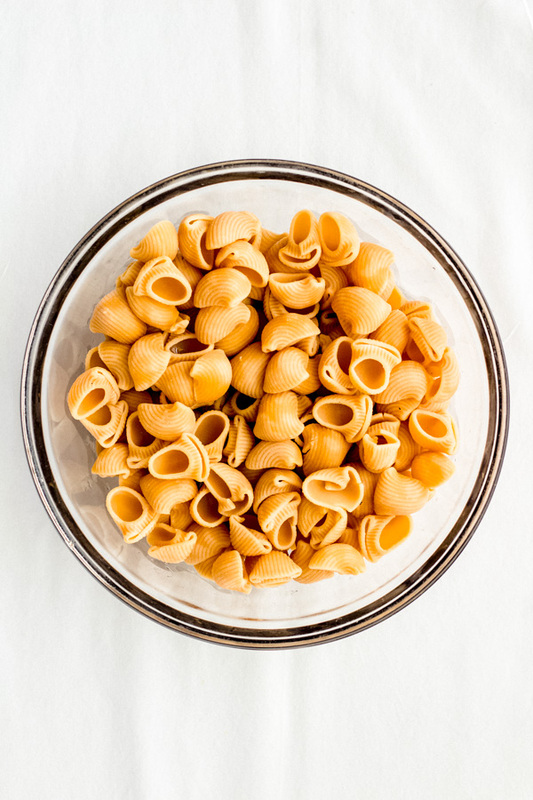 If you don’t have specific instructions – bring about 3 quartz of water to a boil, add a pinch of salt, and then add pasta and stir occasionally. Boil for 5 to 7 minutes or until pasta is soft and tender. Drain the pasta using a colander and then set aside and let it cool down. Prepare the orange tahini dressing. Add all ingredients listed under ‘dressing’ to a measuring cup or bowl, and using a whisk gently combine until smooth. Set aside. 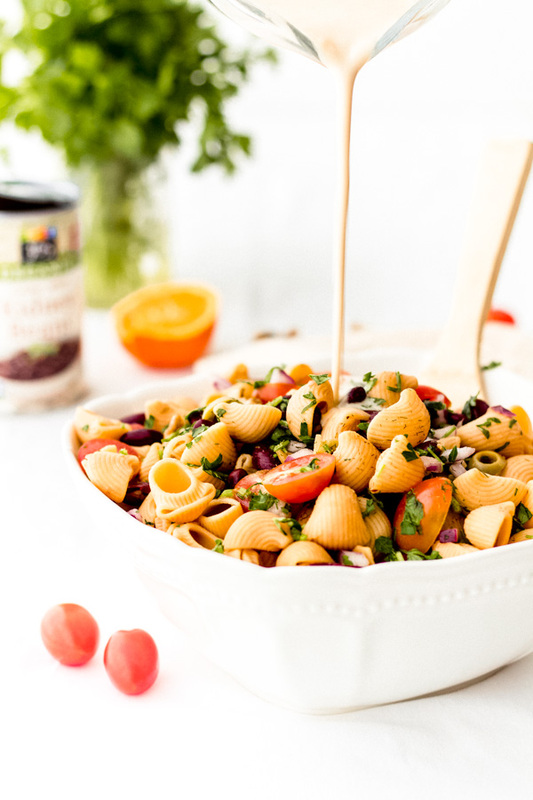 Chop all of the veggies (tomatoes, olives, onions, parsley, and walnuts) and add to the pasta bowl once the pasta is room temperature and gently combine. Add a pinch of salt, black pepper, and dill weed to taste. Add the dressing to the bowl and combine until evenly coated. You can serve right away as is, but I prefer to let it sit in the fridge for an hour or two before serving. Make sure not to overcook the pasta. You want the shells to hold their shape, but if you overcook they may become soft and mushy instead. You can enjoy this dish at room temperature but in my opinion it tastes best after it’s been chilled for a bit. I used freshly squeezed oranges – please note that different types of orange juices can affect the flavor. If unsure, always start with a smaller quantity, say 1/4 cup, and then add more orange juice as needed to reach your desired flavor. The dressing makes 1/2 cup which I found to be enough for this serving size. This makes 6 servings of 1 cup each. Each serving contains at least 1/2 cup of pulses.